It may be the end of summer, but that still means we have to dress for it. Yes back to school sales, fall fashion week, and more are ahead of us; but we still need to get dressed for now. So today I give you a great option for hot weather. 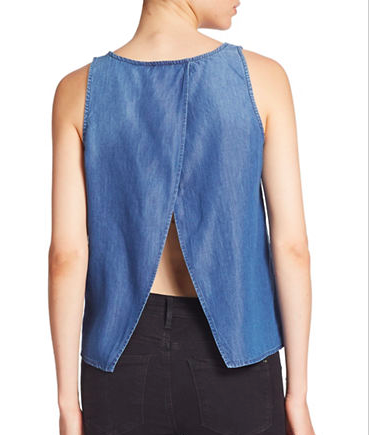 The slit back top. It's so breezy and keeps you cool on these hot end of summer nights. I love these colors and the sweet back opening is low enough that you can still wear a normal bra. Super soft chambray is ready for any bottom in your closet. Chino shorts, printed skirts, jeans, you name it. How perfect is this for fall? 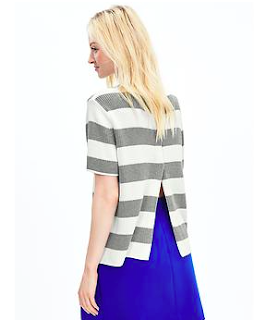 A heavier knit with a peek a boo slit. End of summer picnics? This top. A great detail isn't easy to pull off, but these slit back top options are effortless and simple.